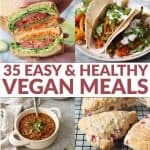 30 minute meal! 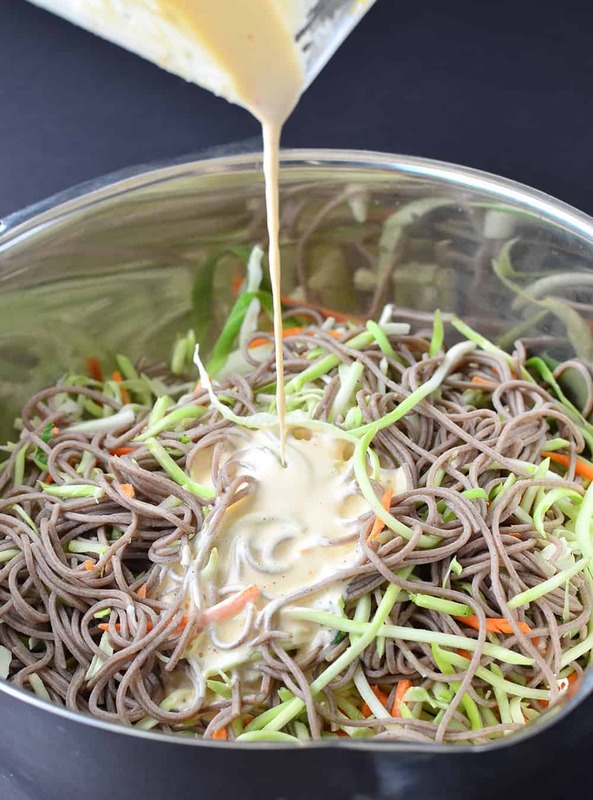 Rainbow Soba Noodles with Creamy Peanut Sauce! 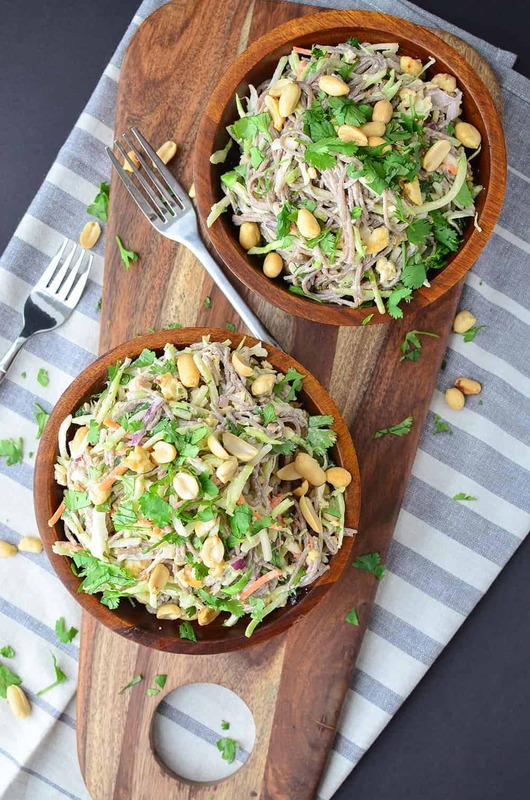 This healthy recipe is soooo good and packed with protein and fiber – you’ve gotta try it! It’s been awhile since I’ve shared a pasta recipe with you. And by awhile, I mean a few short weeks, which in my world is for-ever. It’s weird, now that I’m eating most of my meals alone, I’m beginning to care less and less about what I’m actually making. Case in point, two nights ago my dinner consisted of cobbler leftovers and then last night I enjoyed a giant plate of fresh tomatoes, mozzarella, and wine. Perfectly acceptable solo dinners, not so much when I’m responsible for others. This meal is everything I love about summer cooking- or lack there of. It’s pasta without the heaviness of “pasta”. 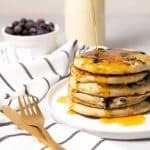 While I still want my noodles morning, noon, and night, I need a meal that will make me feel energized and ready to tackle my to-do list, not wishing I was laying on the couch catching up on HGTV. 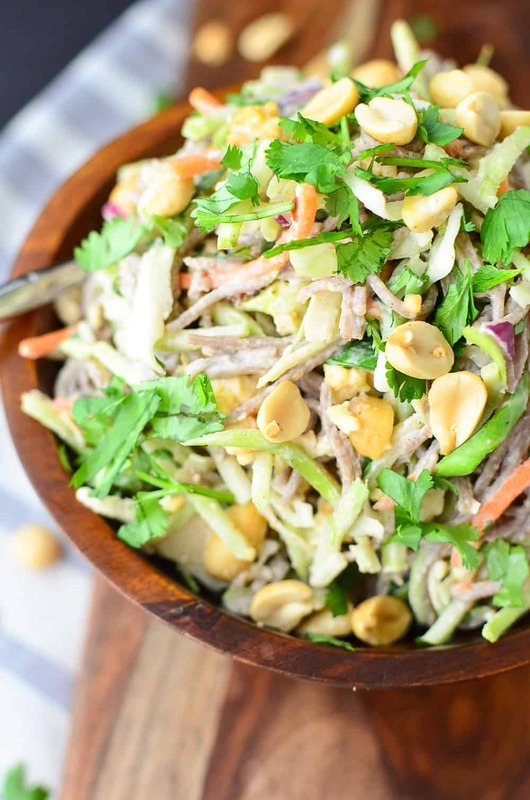 Lots of vegetables, fresh cilantro, and the best creamy peanut sauce should do the trick. The secret to this dish is that even though it’s got all the NOODLES, it’s actually more salad than pasta. I know pasta is still a four-letter word to a lot of people, but I want to show that yes, really, you can have your carbs and um, eat it too. 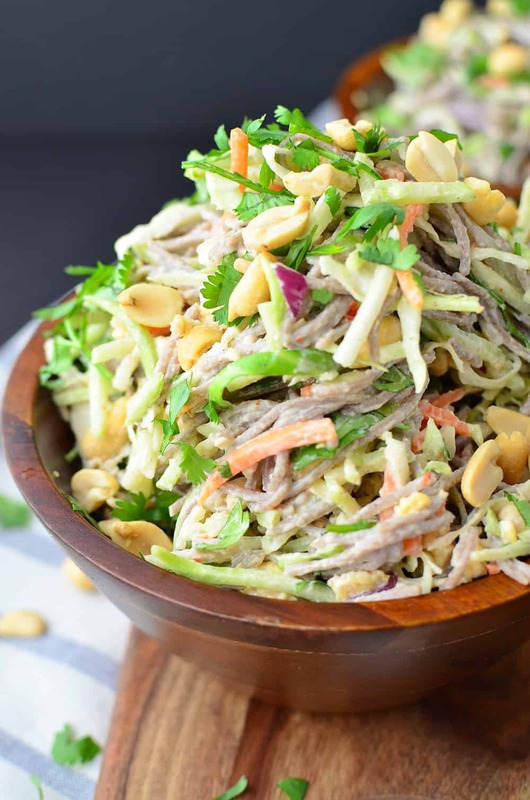 I’m using a few different vegetables to bump up the flavor, texture, and fiber of this dish: prepared broccoli slaw and shredded carrots and napa cabbage. Trader Joe’s broccoli slaw might be my favorite addition to pasta, it’s great cooked or raw and for $1.99 a bag, I throw it in just about everything. If you like zucchini noodles, you’ve gotta try this! Similar taste, none of the work. Which is kinda my theme song these days. Covered in a slightly-spicy peanut sauce, you almost forget that you’re eating a almost a cup of shredded vegetables per serving. I wanted to keep this meal as easy as possible (read —> cooking for one) so I scaled down my typical peanut sauce to just the basics: peanut butter, garlic, lime, little vinegar for brightness and red pepper flakes for heat. So simple, so easy. You don’t even have to whip out the blender for this one, just whisk in hot water and the peanut butter should melt enough so that it’s thin enough to pour on. A note about the consistency: the sauce may be runnier than you’d expect, but that’s OK. If it’s too thick the noodles will glob together, leaving you with noodle and veggie clumps rather than twirl ready strands. To add to the texture party, I threw in some baked tofu which I secretly think is the best way to quickly prepare tofu. After you rinse, drain and press it, crumble into a glass baking dish and toss with a little oil and sprinkle of red pepper flakes. Ta-da! Once it bakes, you’ve got perfectly chewy, tofu that rounds out the crunchy vegetables and toothy noodles perfectly. This meal is the complete package: whole grain carbs, high fiber, healthy fats and a good source of protein. I like meals that do all the nutritional heavy lifting because when it’s just me, I don’t want to worry about side dishes or main courses. I need everything in the same bowl… and as few dishes to clean as possible. Preheat the oven to 400 degrees F. Crumble the tofu and toss with 1 tsp. oil, 1 tsp. red pepper flakes and place on a baking sheet. Roast until tofu is golden and crispy, about 20 minutes. Place the peanut butter in a bowl and whisk in the hot water. Whisk in the apple cider vinegar, maple syrup, minced garlic cloves, lime juice, zest and pinch salt/red pepper flakes. Taste and season more if needed. 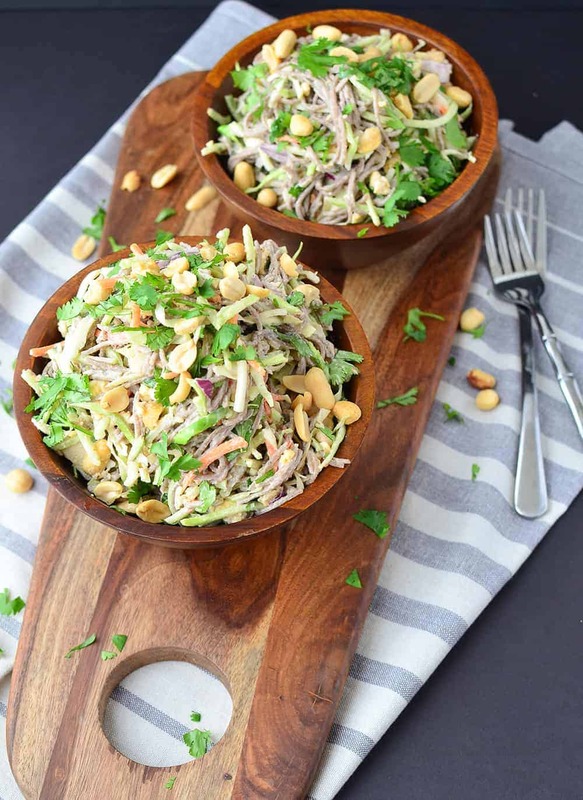 Place the cooked noodles, shredded cabbage, broccoli slaw, and onion in a large bowl. Add the dressing and toss well to combine. Toss in the tofu, peanuts and cilantro. Serve immediately. I’m taking advantage of the yummy shredded broccoli and carrot slaw from Trader Joe’s. As an alternative, add in 1 cup shredded carrots and 1 cup shredded broccoli or extra cabbage. Or get crazy and sub in thinly sliced bell peppers and cucumbers. Almost anything should work! Hi Pip! This serves 4. I’m loving the different colors in this recipe. It’s so pretty. I made this for lunch today and it’s so yummy! It’s gonna be in my favourite list of dishes!! I did not add garlic into the sauce because I don’t like raw garlic and it tastes just as good. Thanks Alex for the recipe!